Even some of the best memory foam mattresses are relatively inexpensive and satisfying from a consumers point of view. They are also by far the most common and popular choice for sale today. Overall they are hands down the best option without fail for those who suffer from varying types of joint or back pain due to the unique way the foam contours to body and spine, thus providing pressure point relief throughout the areas which require it most. Whether you are a side sleeper, prefer sleeping on your stomach, or your back, the contouring foam can adapt and provide unrivaled spinal alignment and support, making this an excellent orthopedic option. Considering there are cheap, mid-point and high-end options which are distinguished by the type of foam, i.e., traditional visco, cooling gel, or plant infused, there really is a memory foam mattress for everyone. 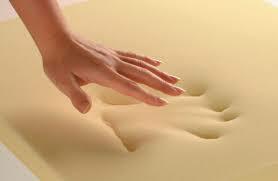 All-latex mattresses are considered the cream of the crop when it comes to mattress ratings. They are generally made of natural substances, i.e., processed sap from the rubber tree, so are naturally hypoallergenic, and resistant to many of the things which would usually contribute towards the degradation and reduction of longevity. There are slightly cheaper “blended” options which are not 100% natural latex, but they are just as good and at a fraction of the price. Probably one of the most expensive types of mattresses for sale, they are supportive, springy, yet firm. Overall, most sleep connoisseurs and sales associates in a store would opt for one of these if money was no issue. Probably the cheapest and least popular in recent times, the innerspring was once the most popular with mainstream consumers. It has since been overtaken by the aforementioned memory foam and latex variants. The innerspring still has loyal fans, especially for those who like a firm yet bouncy surface, and for those who do not like the contouring and padded feeling offered by memory foam. The spring construction has a shorter life expectancy and is more prone to sagging. They are generally very heavy in weight, meaning they cannot be maneuvered easily, and nor is delivery easy because they cannot be delivered rolled or vacuum sealed, i.e., bed-in-a-box solution. The hybrid mattress is much more common than one may think. A vast majority of mattresses for sale are in fact classed as a hybrid, but rarely are labeled accordingly. In this day and age, numerous manufacturers choose to mix materials in the form of different layers to provide the ultimate in comfort. 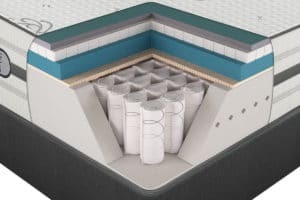 So, a typical example of a hybrid mattress would be a thin layer of memory foam on top of pocket springs or a latex comfort layer over viscoelastic foam. These combinations (among others) make very satisfactory products, and in fact, some of the top rated mattresses are of a hybrid nature. Regarding cost, they are not dramatically more or less than any of the others listed here, and so overall make a good option for those who like the best of both worlds. 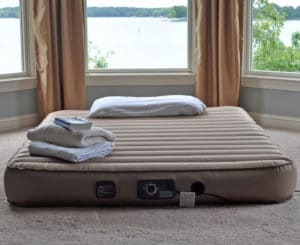 There are plenty great uses of an air bed; whether it’s for home or outdoors, permanent or temporary, these are a popular choice for the everyday consumer. The most common use of air beds is for temporary usage, for example, when guests visit, or when you visit them. Their compact, portable, and inflatable nature make them an extremely flexible option. Often they come with carrying bags so they can be taken almost anywhere by hand or in the trunk. If you choose to keep the air bed packed away and occasionally used, simply inflate and use within minutes. Perhaps you’re used to sleeping in a smaller bed, that doesn’t necessarily mean you should. Imagine fish in a bowl, a dog in a kennel, or a lion in a cage. Admittedly all can survive but not quite as freely and happily as preferred. Likewise, the human body needs space to sleep, stretch and grow. Psychologically a vast majority of people are generally happier in spatially abundant areas as opposed to being cooped up with minimal room. When it comes to sharing couples, more space means less disturbance to one another. Although reading our reviews you will come to learn that some are better at providing motion isolation than others, not all are entirely effective. Therefore an abundance of space to roll around can help iron out this flaw in specific models. In hotter climates, sleeping too close to each other can increase body heat which will not only lead to reduced quality of sleep, but also the increased amount of sweat which seeps through will most likely cause mold and bacterial growth, which will, in turn, cause a reduced product lifespan. Mattress firmness should also be considered. It’s a misnomer that a hard mattress is best, and actually, a bed’s support is provided by the inner coil or foam layer. What changes is the top level, and how soft you like it depends on personal comfort. Typically, most people are happy with a medium-firmness, though side sleepers do tend to prefer something that’s a little softer. Provided you know the type of feel you most prefer, stick with that option. Mattress firmness preference should be decided beforehand, based on previous experiences, decide on plush, medium or firm. Buying a mattress should be considered a fun investment in health and well-being as opposed to an expensive burden. There are varying types which are available in every price range, which is excellent. However, the best, unfortunately, is rarely going to be the cheapest. It’s interesting how the price range is such a huge one, a broad spectrum from cheap to expensive will happily consist of memory foam, air, innerspring or hybrid. There is a reason for this, and that’s the age old saying “you get what you pay for.” If you’re happy with replacing the one you buy today with another within a few years because it has begun to cause back pain, sag, and lose support, then, by all means, buy one which is cheap and most affordable at the time. 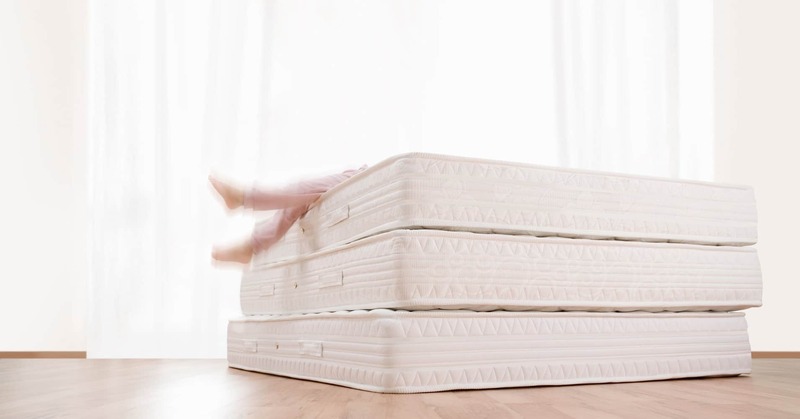 Not everyone has the money to splash on top rated mattress brands, but rest assured if you do, there will be little disappointment, much longevity, and premium levels of pressure point relief, spinal alignment, and joint support. There is also middle ground for this too; not quite low enough to be considered cheap, but certainly not the most expensive out there either, in between exists as the mid-price point category whose products should suffice for most people. Some people suffer from allergic reactions when exposed to the proteins found in latex rubber. In fact, it affects almost 3 million people in the US every year, causing mild to severe symptoms ranging from a stuffy or a runny nose to life-threatening situations. Those allergic to the tree sap in rubber will naturally, of course, be affected by latex mattresses. Therefore if in any shadow of a doubt, even if the product is a blended mixture of part natural and part synthetic rubber, it’s a good idea to give this type a miss. 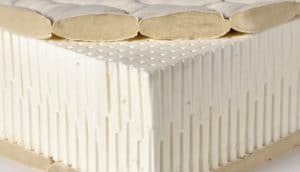 Considering that the ideal choice of mattress for latex allergy would be something which is free of the substance, perhaps opt for a memory foam or an innerspring instead. This is one of the most common allergies in the US, with approximately 20 million people being affected by it all year round. Those who suffer from dust mite allergy already know the symptoms which range from sneezing to watery eyes and itching, but it’s handy to know that there’s much more control over this than one may think. When it comes to sleeping in bed, the place you spend 1/3 of your life, did you know that an innerspring mattress is notorious for harboring the most dust and bacteria? Over the years, dust mites and their feces can gradually seep through the fabric and into the hollow workings of the interior, whichever mattress types you may own, which eventually then becomes a massive chamber of dust mite feces and dead skin cells. Every time the springs are triggered (or the bed is used), this great big dust chamber becomes live and dust will no doubt find its way back into the open air, into your lungs, and onto the skin, thus triggering allergic reactions. Therefore, the recommended mattress for allergies and asthma would be memory foam or latex (if you don’t have a latex allergy too) because they are not hollow and are less permeable. While there are very few reported cases of allergic reactions occurring from those exposed to memory foam, it’s not entirely unheard of. Unlike latex and dust mite allergy, there isn’t a specific name or condition associated with memory foam as a whole, but that’s not to say the chemicals found in this material are 100% irritation free. However, if you’re at all concerned with the potential reaction which may occur, to be sure, perhaps it’s advisable to start with a memory foam pillow which can be found at a relatively low price. 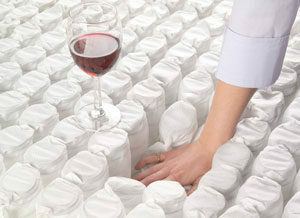 If all goes well, then maybe you can begin to shortlist one from some of our mattress ratings. For some people, brands are just a name, a tag and nothing else. However, it’s worth noting that in this industry, good mattress brands and manufacturers are critical to whether you end up with a satisfactory purchase or one that will be sent back before the trial period is over (and that’s if they even offer an in-home trial). As always, you get what you pay for; buy a cheap mattress from an entry-level budget company, and you’ll get cheap quality goods, whereas by going with a reputable company and trusted manufacturer you’ll have better quality goods and professional aftercare. There is a vast difference between the two, which range from length and type of warranty, length or availability of trial at home, and of course comfort and longevity of the product itself. Additionally, it will have had rigorous safety checks put in place (such as CertiPUR-US) to meet stringent compliance and legislation, some of which are mandatory and others are voluntary. As this is the manufacturer’s responsibility for adherence and to comply with, it’s not impossible for corners to be cut and the consumer left with a sub-par product which may even be unsafe. Our unbiased reviews on this site discuss things like warranty, materials, composure, compliance and much more; we also take these factors very seriously and only bring forth the best mattress brands for our readers. 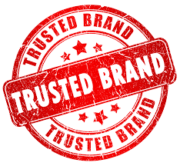 Some mattress companies are so confident in their products’ durability that they offer long-term warranties. In fact, some companies offer a 25-year warranty, while others offer a 10-year option. Even if you don’t need or want a warranty, you should consider the company’s return policy. What if you try to sleep on your new mattress the first night and you still wake up a hot mess? You will want to return it and get something else. Be sure that the bed you get doesn’t leave you stranded. Learn more about mattress returns and exchange. If you are the kind of person who cares what companies you give your hard-earned money to, you may make sure that the mattress you buy comes from a company with policies you support. For example, many great mattress companies only manufacture in the United States. In that case, you can feel good about sleeping well knowing that your product has been made to the highest standards and met the strictest regulations. Also, mattresses with materials sourced in the US and made here are great for supporting the local economy. So to conclude our mattress buying guide, choose a type which suits your every need, and your partners too if you’re sharing. 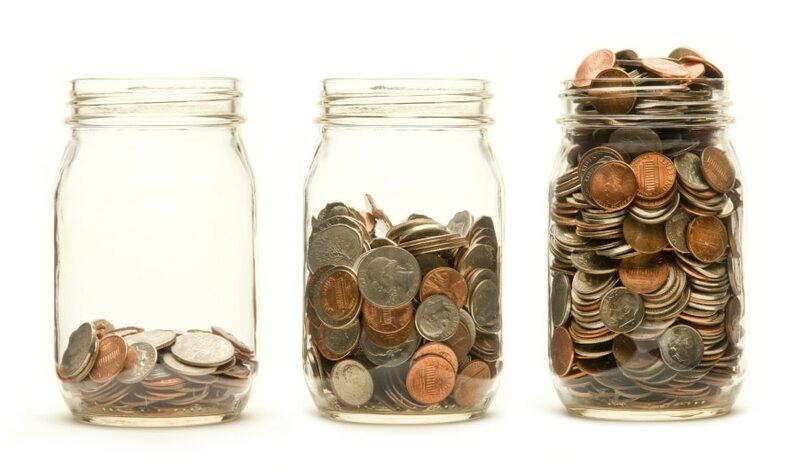 Make sure it’s one which you can afford; don’t overstretch your budget, but don’t scrimp either. Aim for the biggest size possible, but make sure it comfortably fits in your room of course. Remember to consider allergies as this can either alleviate or aggravate depending on the opted type. Also, be sure to avoid cheap knockoffs, and buy only reputable brands, it really is more than a label. Follow these simple guidelines, and this will prove immediate benefits from day 1, all the way through to when its time to replace. Lindsey my son has a beautiful antique sleigh bed but he measured for a mattress and his measurements are 64 wide 74 long please tell me what size mattress to buy for this beautiful bed please. This could be tricky. The closest size to this that I can think of is an RV Short Queen which is 60×74, so still not quite an exact fit unfortunately. I’ve been wanting to find the perfect mattress, and I think that being able to look for some cheap options would be ideal right now. I’m glad you talked about being able to watch out for memory foam allergies, which I think is very helpful. I’m going to have to see if I can try a few different kinds of mattresses, and see what we can find!